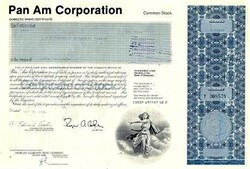 Beautiful engraved Stock certificate from the Pan Am Corporation. The vignette a woman walking on clouds and the document has an ornate right block border. It has the printed signatures of the company's officers and is over 20 years old.